Display your Wufoo forms within a lightbox to create a seamless user experience. A lightbox is a variation of a common design pattern called a modal window that darkens the whole browser window and presents a smaller box in the foreground to draw focus to that content. A really common use for lightboxes is to show larger versions of images after clicking on their thumbnails. You can, however, use it to call any type of content. In this article we’ll show you how to load a Wufoo form inside a lightbox, some things to watch out for and do a quick overview of the new callback function for helping handle the height resizing. Another consideration is the fact that Wufoo forms can grow in height when they are submitted with errors. When a Wufoo form resizes, it will call the function of the name you provide and pass it the new height of the form. In the example above, the function we’re calling after the form resizes is resizeTheColorbox. With this ability, you can adjust things as needed to accommodate the new height. A popular jQuery plugin for lightboxes is Colorbox. Colorbox has all the things a great lightbox plugin should have: small size, lots of options, the ability to accommodate any kind of content, and lots of design hooks for customization. "href": "#wufoo-form iframe",  // selecting the iframe only! Notice we are targeting the iframe specifically, not the entire wrapping <div>. Many lightbox plugins use set heights on the actual lightbox content area. Colorbox is no exception. This would be a serious roadblock for us, because as we showed above, a Wufoo form will grow in height when submitted with errors and a set height could cut off the bottom of the form and make it unable to be submitted. Fortunately there is a solution! We can use the new resizeDone parameter to specify our own custom callback function. See the embed code above for an example. The function name you specify will need to be of your own creation, and within it, you do whatever you need to do to accommodate the new height. It accepts a single parameter that will be that new height. The colorbox plugin has a built-in function you can call specifically to do resizing. In the code below we make a global variable __savedHeight, then use that to resize the colorbox. We also call our custom function every time the lightbox opens to ensure it is always the correct size. Supports “inline HTML”. Many lightboxes support images only. To use with a Wufoo form, you’ll need one where you can put HTML content inside the lightbox. Has a resizing function. Colorbox has that nice .resize() function that we can call with our custom callback that makes accommodating resized forms nice and easy. Any lightbox that has a public resizing function like that will work great. Or, able to be styled through CSS. Many lightbox plugins don’t have public resizing functions. You may not need one if you can control the styling of the lightbox to not have a set height, so the content can grow as needed to accommodate a resized form. I hope this was helpful in showing you how you can indeed put Wufoo forms into lightboxes! 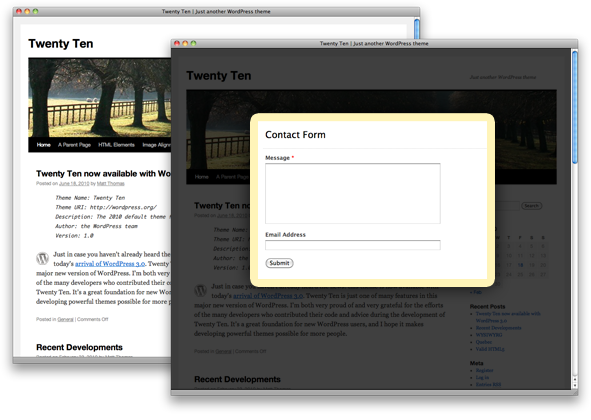 The lightbox technique can really help focus a users attention as well as allow you to display a form on a page without using up a lot of space on your web pages or requiring a browser pop-up window. If you have any questions, please do let us know.